First if your data is important visit our flash drive data recovery page for more information on our services. Receiving a “Please insert a disk into Removable Disk”error when plugging in your flash drive? This typically means the metadata stored inside the NAND memory chips has developed an error and the drive has booted into a factory mode to be wiped and reinitialized by the manufacture. Symptoms an unreadable flash drive. If you right click on the drive letter in My Computer and choose Properties the total capacity of the drive is incorrect (Usually 0MB or 0 Bytes). This doesn’t mean your data is lost, it means windows isn’t able to determine the size of your flash drive because it’s unable to mount the drive. In Device Manager under Disk drives the USB flash drive has a different name for example “USBest USB2FlashStorage USB Device”. This means the controller was unable to load the manufactures firmware and is booting into fail-safe mode. This mode allows the manufacture to use a special tool to erase the drive, test the memory, reload the firmware, and initialize the drive. 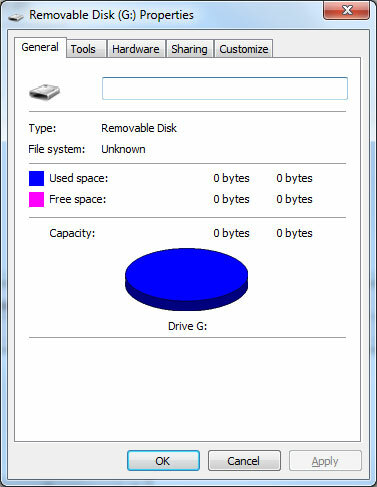 Disk Management shows a drive letter with No Media. Once again this is because Windows is unable to mount the drive. The controller is telling Windows that it’s a Mass Storage device, but doesn’t report back any information. To keep costs down many flash drive manufactures will use low grade or generic NAND memory chips that are sold containing bad sectors. Manufactures rely on the flash drive controller to map out bad sectors and repair damaged sectors with error correcting code so that the end user never knows the internal state of the drive. Low grade memory issues are compounded by frequent writes to the flash drive. Each sector in the physical NAND chip is only good for a finite number of writes. For example flash drives that are 8GB and larger use low grade 3 bit MLC NAND memory with sectors that will start to fail after only 10 writes. While most manufactures will use flash controllers that can compensate for the high failure rate by adding more error correcting code and better wear leveling algorithms some choose to use inexpensive flash controllers that can’t compensate for the high number of errors. There are no free or paid applications that can recover data from this type of damage. The flash drives controller is obfuscating what’s happening on the NAND chip which prevents software from accessing it. If your data is important you must send it to a data recover shop like ours that specializes in flash drive data recovery. Many data recovery shops don’t specialize in flash drive data recovery and can cause further damage to the flash drive. If you need your data recovered, visit our flash drive data recovery page for more information on sending the drive to us for data recovery. If your data is NOT important you can get the drive replaced by the manufacture under warranty or try obtaining the manufactures firmware, repair or mass production tool. If you call the manufactures support line they may give you a link to download the tool. Using this tool may make your flash drive operational again but remember the NAND memory chips are failing, the drive will likely fail again. We have a short list of known manufactures that provide repair / recovery solutions. These solutions WILL ERASE ALL THE DATA ON YOUR FLASH DRIVE. If your data is important visit our flash drive data recovery page for more information on our services.